With the rise of companies like Uber, GoodEggs, and Blue Apron, getting what you want when you want it has become a lot easier. And here are two more to add to your watch-list: Postmates, a three-year-old San Francisco-based delivery service that launched in L.A. two months ago, claims it can bring you anything—food, clothing, video games, whatever—in less than an hour. 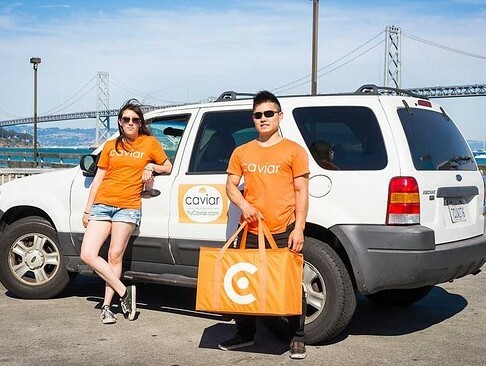 Caviar, also established in San Francisco, is a “curated” premium food delivery service that kicked off in L.A. just this past week. Both assert they can bring grub from your favorite restaurant to your door. So which is better—or at least, which seems to be a better deal? It’s not that simple. Here we breakdown the fine print. How to use it: Postmates has an app that operates much like Uber for Android or iPhone users. Simply sign up, put in your credit card information, and you’re good to go. The home page has a list of featured eateries in your area of which you can explore the menus. Don’t like what you see? No worries—you can also type in the name of any establishment and place a custom order. Pros: The app is super accessible and straightforward. You can track your courier and give a rating after delivery. Cons: If you don’t have one of these smartphones—you’re outta luck. What it delivers: Whether it’s pan-roasted mussels from Cooks County, a crunchy taco supreme from Taco Bell, or a coat from Nordstrom’s (same day shipping, without the premium price), if it can be picked up and delivered, they’ll do it. Delivery is available 24/7. Pros: Seemingly unlimited dining options. And you don’t even have to leave your house. Cons: There’s no guarantee that your selection is in stock, or that your outside-the-app restaurant even allows takeout. Where it delivers: Postmates’ delivery zone includes Sherman Oaks, the Pacific Palisades, Silver Lake, Culver City, Venice, West Hollywood, and more. To see if you make the list, download the app and select “delivery zones” on the “search nearby” page. Folks in Eagle Rock, Pasadena, Glendale, and the Beach Cities are out of luck—for now (the company claims it will be expanding the delivery range soon). Pros: This is one of the most wide-reaching delivery services we’ve seen. Cons: Just because they can bring a Godmother sandwich from Bay Cities in Santa Monica to your house in Los Feliz doesn’t exempt you from the sad reality of a soggy sandwich. The vast range of delivery is exciting, but should be approached with caution. What you’re paying: Delivery fees start at $5 and go up from there depending on the distance between pick-up and drop-off locations. There’s no tip required, but the app gives you the option of adding 10%, 15%, and 20% to your order, all of which goes to the driver. Pros: Given other companies’ delivery fees and minimums, $5 is pretty manageable. Cons: Because the additional distance charge isn’t determined until delivery, you don’t know how much the total is until it arrives—and it’s too late to back out. Current promo: Their free breakfast burrito promo just ended today, but check the blog often as new deals are posted all the time. How to use it: Caviar’s website (trycaviar.com) prompts you to put in your zip code and desired one-hour window period for delivery. From there, the site shows you a selection of restaurants available in your area. Pros: Each menu item is photographed individually, so you know exactly what you’re ordering. After delivery is placed, you can real-time GPS your driver so you know when to expect the goods. Cons: We wish it had an app. What it delivers: Caviar has a select group of restaurants with which it has developed partnerships, meaning you know you can count on the establishment’s cooperation in providing take-out. Upscale spots like Clover, Sotto, and the Churchill all make the L.A. Central list. Delivery is available according to each restaurant’s operating hours. Pros: A straightforward and uncluttered list of delivery options. Caviar does not offer more than one restaurant per type of cuisine, meaning you don’t have to weed through ten pizza parlors. That’s great for the indecisive. Cons: For the same reason some people want the choice made for them, others, who prefer to compare and contrast, might find the list limiting. Plus, Caviar prides itself on supplying only “top-tier” foods. If you’re looking for orange chicken and chow mein, you won’t find it. Where it delivers: Caviar currently delivers to three L.A. areas: Central, Eastside/Downtown, and Westside, but, like Postmates, has plans for expansion. Whatever neighborhood you’re in, determines what restaurant you can order from. Pros: Because they’re only delivering from restaurants in your area, your food is guaranteed to be warm. Cons: The Valley is neglected completely, as is Eagle Rock, Glendale, and the Hollywood Hills. What you’re paying: Caviar has a $9.99 flat rate delivery fee and automatic 18% gratuity. Pros: When ordering for a group of people (40% of Caviar’s customers are corporate), these seemingly steep charges don’t sting quite so much. Plus, you know exactly what you’re paying at checkout. Cons: The higher fees might not be worth it for smaller orders. Current promo: Free delivery for a limited time only. Can a New App Save Lives When the Big One Hits?